As a homeowner, it is important to always look for home improvement ideas to increase the aesthetic appeal of your property while also protecting it. Wood shutters not only add a classical touch to your home but they are also functional and this makes them one of the best home improvement ideas. They add a refined elegance to your home while also protecting it against extreme weather. They also improve privacy and provide natural ventilation in your living space. However, if neglected, wooden shutters can deteriorate fast due to exposure to the elements. The dirt and grime that builds over the surface of the shutters also make them lose their curb appeal and turn into an eyesore. For these reasons, you need to care and maintain your exterior shutters to keep them looking new. Over time, your elegant shutters will collect dust and they will gradually start deteriorating. If not dusted regularly, the dirt and grime build up will permanently affect the surface of the shutters necessitating costly replacement. Dusting window shutters might not feature among your daily cleaning chores but you should consider doing this once after every few weeks. Use a soft duster preferably microfiber or feather duster to dust between the wood slats to keep them looking new. Run the duster on both sides of the slat to completely rid the shutters off dust and other particles. Due to exposure to the weather, it is easy for window shutters to get stains over time. Before dusting or cleaning your shutters, always focus on the stains first. Inspect the stain closely to determine the foreign matter involved. You can either scrape off the stain using a paper towel but if it proves stubborn, use a small amount of wood cleaner to wipe it off. Whenever cleaning wood window shutters, always use a soft material to avoid scratching the panels. One of the easiest ways to clean home furnishing is by vacuuming. When it comes to wood shutters, you will find it more effective to vacuum over the slats to completely get rid of dust particles on the slats. If you have already wiped the slats using a soft cloth, you will still find a lot of dust hidden on the edges of the window shutters and on groves the cloth couldn’t reach. 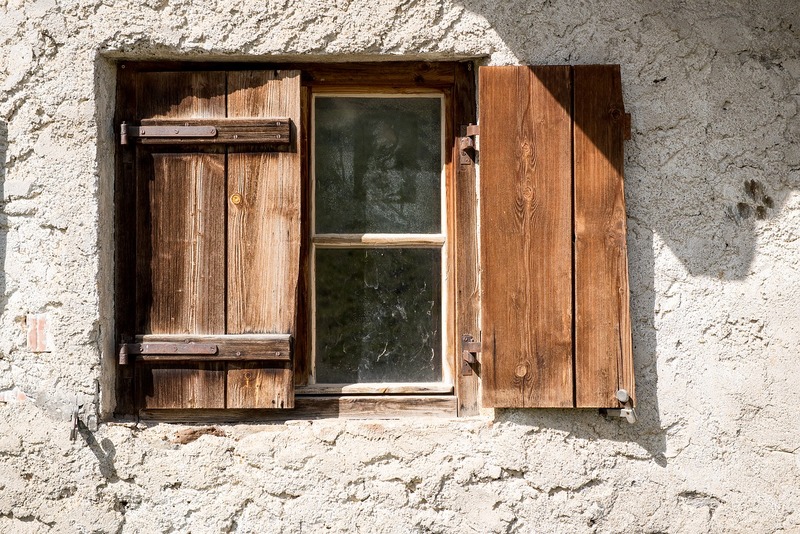 Window shutters suffer exposure to the elements throughout the year and for this reason, they deteriorate fast. To restore your exterior shutters into their former glory, you need to treat them periodically. Most homeowners go to great lengths to polish their home furnishings but forget all about the window shutters. To maintain your wooden shutters looking elegant, apply a polyurethane finish to protect the slats from heat and fluctuating humidity levels. Many homeowners use water and soap to clean their wooden window shutters but this is not the most advisable way to maintain these furnishings. You see, wood and water are not compatible and the exterior shutters have to undergo intense treatment before installation. As such, you should avoid using water to clean your shutters and instead apply a small amount of dilute wood cleaner to swab the slates. Avoid using excess water to clean and rinse the slats because this compromises the integrity of the treatment originally used on the slats. Unlike interior shutters which you can always look at every day, it is easy to forget all about the exterior shutters. For this reason, you might not note any damage to the surface of the slats until it is too late. As a homeowner, you need to take proactive care of your home. During storms, there is a high likelihood of damage to your window shutters and you should carry out an extensive inspection of these fixtures. Many homeowners neglect their shutters until it is too late and this costs them a lot of money. To avoid unnecessary repair costs or replacement, look for minor damages on your window shutters through close inspection. Over time, the initial paintwork on your window shutters will deteriorate and this leaves the wood underneath exposed to the elements. Panting wooden window shutters not only enhances curb appeal but also increases the life of these furnishings. If you notice paint peels or other signs of paint damage, it is time to give your windows a makeover using a fresh coat of paint. Your home is a precious investment and there’s no gainsaying how valuable it is to your family. As such, you should never compromise when it comes to providing the best care and treatment to the property. Cleaning exterior shutters require the services of a professional window cleaner as these experts have the expertise and the tools to get the job done safely and effectively. Many homeowners have suffered injuries trying to clean their windows and to avoid such accidents, you should call in a professional from your city. Ask for referrals from your neighbors to find a reliable window shutters cleaner. These professionals also carry insurance and in case of any damage to your property, you don’t have to worry about repair costs. There is no doubt that wood window shutters are an incredible improvement idea for your home. They add to the aesthetics while at the same time improving privacy, protecting the windows and offering natural ventilation. However, wood material requires close attention through cleaning and maintenance to keep the shutters looking great. Through close inspection of wooden shutters, dusting, and regular cleaning, it is possible to maintain these fittings in tiptop shape. You can also repaint the shutters to restore them to their former glory and give your house a new look. Whatever you do, always make sure you take care of your home’s wood window shutters for them to function properly.